Real Food. Real Talk. Real Good. So, I hear the Super Bowl is going to be happening on Sunday. I’m going to be honest with you and let you know that I have no idea who is playing, and very little understanding of Football itself other than the obvious “CLEAR EYES, FULL HEARTS, CAN’T LOSE!”–You know, those Friday Night Lights feels. Texas Forever. Coach Taylor. Jason Street. Riggins. QB ONE! Ok, those aren’t really sentences, but rather just me blurting out names. Cool. Cool, cool. The thing is, I grew up in a football watching household. I lived through that era where the San Francisco 49ers seemed to dominate on the regular, and my parents would wear Joe Montana jerseys. My grandfather would do a victory dance each time where was a touchdown. How I managed to not pick up on the game says a lot about my general disinterest. I used Monday Night Football to snarkily comment on the very shiny, very tight pants of the players while simultaneously complaining that I’d rather be watching anything else. I would take this time to do an art project and eat whatever kind of dip or snacks had been put out. That’s one thing about football-loving-folk that I can get down with—YOU GUYS LIKE SNACKS AS MUCH AS I DO. It’s the great unifier (note to self: try healing the political divide with an epic snack platter that spans 50 states. We’re going to need more crackers and cheese). I might not want to watch the Super Bowl, but I will come over and park myself next to a vat of guacamole, or onion dip, or literally anything. God Bless Snackmerica. Even as an adult, I still find myself turning on the Super Bowl in order to give myself a free snack pass. This is where the TV is on in the background and you have a whole bunch of five layer dip in the foreground. Or, in the case of today’s recipe, A PLATE FULL O’ WINGS. 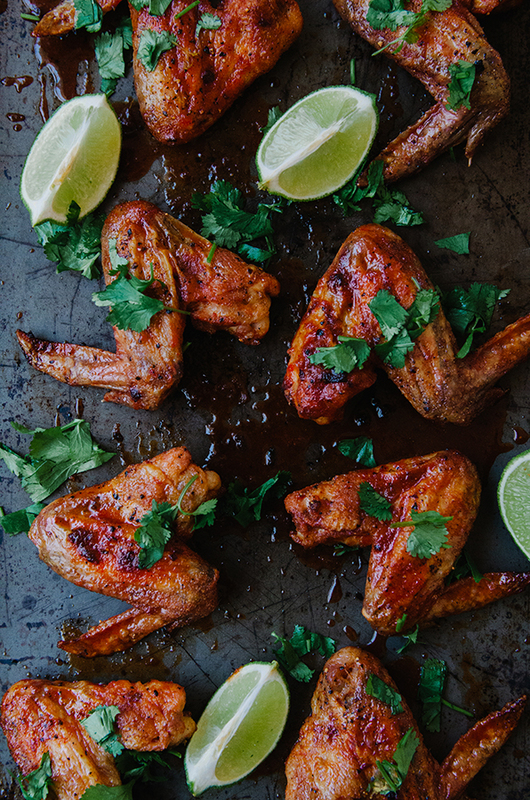 These crispy lil’ wingies are baked in the oven and then tossed liberally in a red curry and tangy lime sauce. They’re super flavorful, and will pair perfectly with an entire bowl of guac, three handfuls of pigs n’ blankies, a trough of spinach dip, some slow cooked beef and like all the margs you plan on drinking. Don’t look at me with surprise, we all understand what’s going to happen come Sunday. 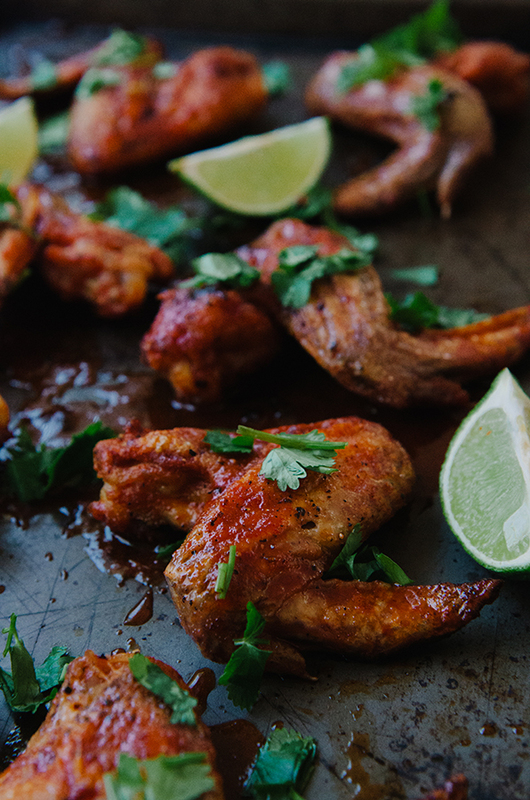 I hope these easy wings find a place on your table, whether you’re into football or not. Because, wings. Clear eyes. Full Tummies. Can’t Move. I developed these wings for two people, but if you're feedning a crowd simply double, tripple, or quadruple the recipe! Preheat the oven to 425 degrees F. Line a baking dish with parchment paper and set aside. Liberally season the chicken wings with salt, pepper and granulated garlic on both sides of the wing. Place the wings evenly on the parchment lined baking sheet and bake for 45 minutes. Add the red curry paste, coconut aminos, honey and lime juice into a large mixingbowl. Whisk together unitl it comes together completely. Add the hot wings into the bowl with the sauce. Toss until the wings are completely coated with the red curry sauce. I like to use a pair of tongs to do this. Also, to get them fully covered, you might need to do this step in batches. 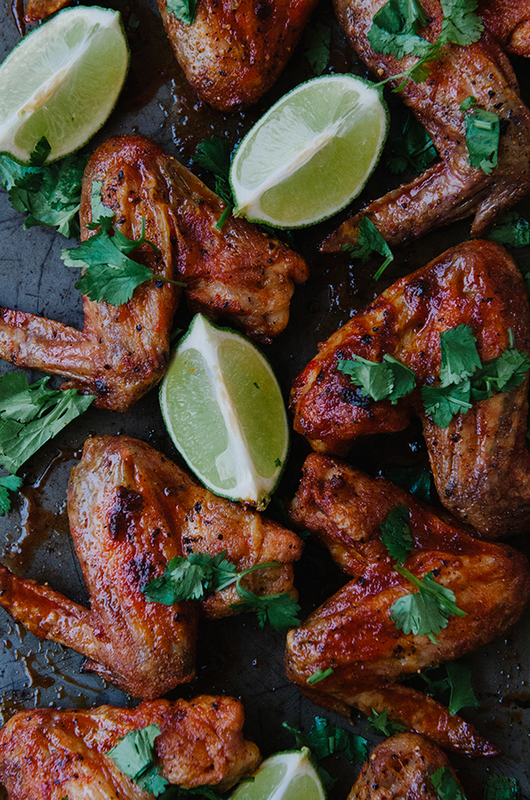 Place the sauced wings on a plate and sprinkle with chopped cilantro to garnish. If you don't like cilantro, you can use parsley, or leave them naked. Serve immediately and enjoy! Enter your email below to get the latest posts delivered right to your inbox! 25 Whole30 Recipes to Help You Thrive (Not Just Survive)! This is what I’m calling an EGG-SALAD-SALAD and no, I didn’t stutter. 🤪 It’s so easy, and so delicious! Want to get more of my recipes and posts delivered right to your inbox? Just enter your email below and I’ll send them to you when they’re freshly posted!